Travel the world’s barbecue trail and you’ll find lots of grilled sweet potatoes. In Korea, where sliced grilled yams come with a garlicky soy dipping sauce. (Find the recipe on page 421 of Barbecue Bible.) At Barbecue University in Colorado Springs, where we cook them caveman-style—roasted directly in the embers. 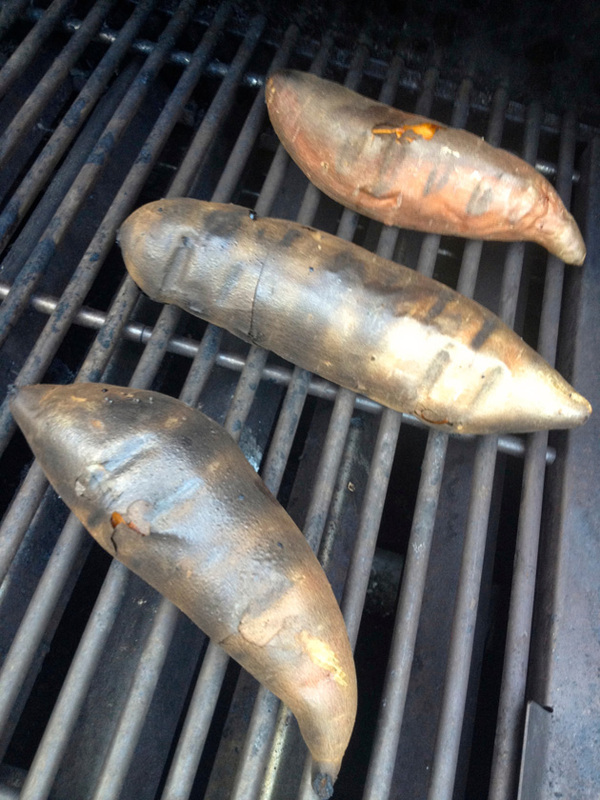 Normally, when it comes to starchy tubers like sweet potatoes, you set up your grill for indirect grilling. But lately, we’ve been using a technique associated with steaks and chops: direct grilling. Provided you work over moderate heat, you get a crackling crisp skin and a moist creamy interior. And the dry heat of the grill caramelizes the natural plant sugars, intensifying the potato’s sweetness. Use a bamboo skewer to test for doneness: It should pierce the potato flesh easily. Cut the potatoes in half lengthwise. And the crowning touch? A stick of herb or truffle butter. Make your own flavored butter by following the recipes starting on page 128 in Sauces, Rubs, and Marinades. Or try one of my Planet Barbecue Grilling Butters, available from select Whole Foods markets and Earthy Delights.